Blogs are curious things, and they do present life in a rarified way as an edited version of all that is going on. I get it. In fact, there are a couple of sites I visit for the sheer purpose of being annoyed. I ask myself how do they do it? As if each morning a flurry of buntings dresses them, and coffee brews in a French press delivered by the French press. Harvesting grapes is easy, especially when all of the farmhands have fallen from the pages of Abercrombie and Fitch. The wine practically makes itself. Each dinner is a six-course Babette’s Feast, and the house, make that chateau, is always spotless and well-appointed. They leave a couple notes and doodles on a napkin, and it’s discovered by a rep at Harper Collins who wants them to write a cookbook and host a cooking show. A simple farm bouquet is an armload of homegrown, blackspot-free roses and softball-size dahlias that look incredible in the eighteen-century sterling urn they found at the neighbor’s garage sale for 25 cents. Yep, life edited, indeed. So rest assured, life on the farm is pretty real, a litany of projects unrealized and chores ignored. Toss in some dog-based distractions, neighborly interruptions, a pinch of procrastination and indecision, and too few hours in the day. Something we all understand and share. So here’s to all the cluttered closets, dusty to-do lists and sinks with last night’s dishes piled high. Oh yeah, we’ve got better things to do. Let me offer this encouragement; you are not alone. The bad news: roof on, spring cleaning will hopefully happen in October. 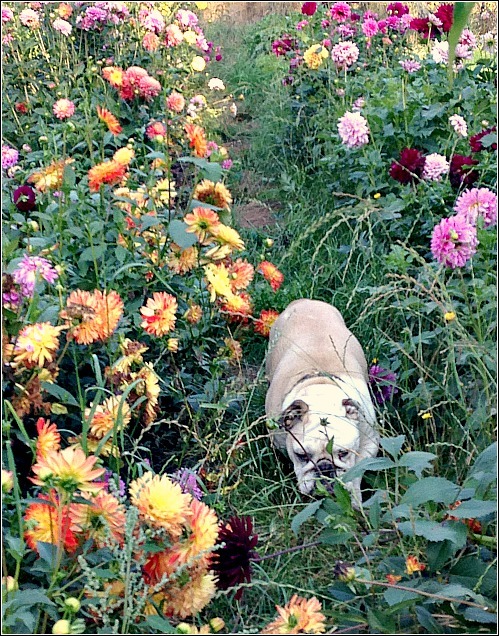 Boz in the dahlia field, pointing out that the weeds are taking over. The greenhouse was not built in a day. I hope to finish it up in the next few days, adding side wall roller bars and venting transoms on the side walls. 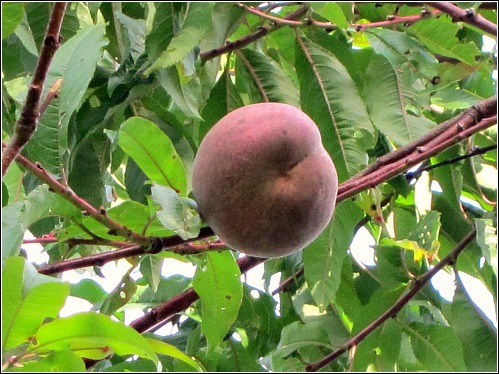 One peach out of eight peach trees; cold spring rains result in poor pollination and fruit set. I very much enjoy seeing the “real” world that people occupy. Yes, sometimes some of those sites look idyllic, but I’m sure, just to the left of the camera, someone’s cat is bringing in a dead robin, the pot of homemade jam is scorching, and dear god, the help just quit. Ha! 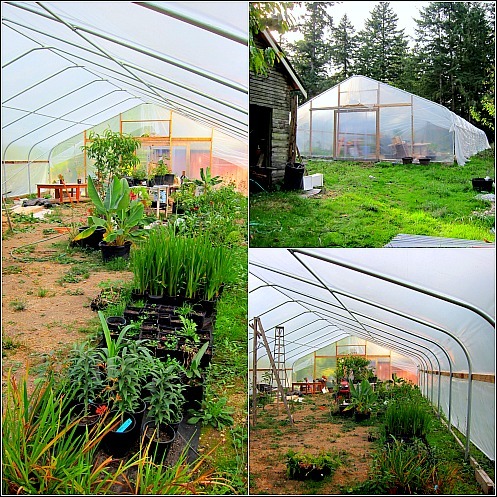 I’m very much anticipating that greenhouse…..FULL! Thanks Sue, and I’ll keep you posted on the greenhouse. This time of year it’s a nice reprieve from the rain. I may just plant a lawn, palm tree and chaise lounge in one corner. Love is….imperfection. And potatoes growing in the back of a ute. 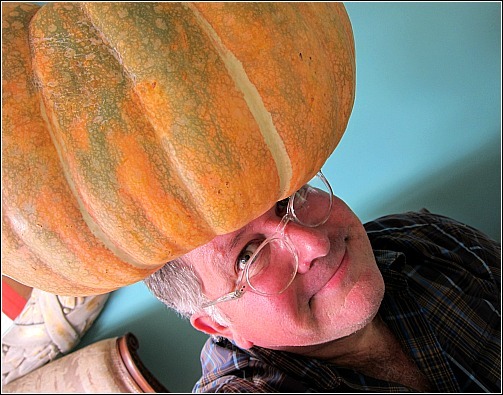 And shots of some dill balancing a pumpkin on his head. And the only pear and peach. And the faces of two expectant hounds in the car waiting for a trip. And a messy “House for Polly”. Sigh! Well said, Jacqui, then I am feeling the love. Perhaps that is my problem. I don’t have the selective eye! I don’t Sarah, I love what you share on your site, in fact, I’m checking out your bread and butter pickle recipe after this entry. Deb, I have a brilliant idea: barter. Fish for Pie, though at current Seattle prices, your freshly caught Alaska salmon would outweigh the purchasing power of any of my pies. Say hi to Sam for me. Love the new look of your blog. 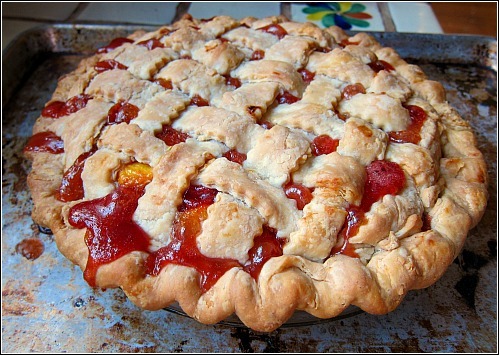 And the peach pie! Wendy, I love your thinking and kind words of encouragement. I will take them to heart. I commend you, Sir, for your honesty, and bravery! At least now I know we’re not the only ones with half done projects, and novel organization techniques. 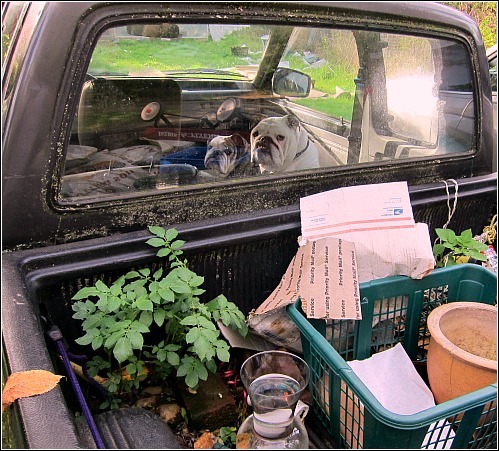 I must say though, the potatoes look quite at home in the bed of your truck! Thank you Clare, though I’m sure I could learn a lot from you. I aspire to your level of organization and skill. And you have cute goats! Your farm surely inspires; hay in the truck is merely the cherry on the sundae. The joy of living a messy life is far more interesting than one where style trumps substance. I would rather tuck into a nice warm pie with good friends and dishes in the sink then stop everything for that instagram pic and subsequent tapping away on iphone. I have many stories of life with my uptight mom. Poor dear never got over my getting chocolate on the dining room chair as I still hear about it some 45 years later. Thanks for being that stylish guy with substance, and a good pie recipe! Thanks Jan, oh good I believe that is support for embracing my mess. Awesome! Thanks for the kind words and the island smiles, your bright approach is contagious. I would love a self serving french press! As for the junk drawers and other messes – isn’t that what winter is for:-)? Glad you survived the rains Tom.. Thanks Margaret, and you are so right. My plan (cue the laughter) is to tackle, uh make that approach, one drawer a day. If I haven’t used any of the contents in the last 2 years (hey baby steps for me) I’ll give it to charity or a friend in need. Isabel You had me a concord grape pie and apple crisp cheesecake. When things settle down, drop me a line with those recipes if you are so inclined, and my dear neighbor to North, Happy Thanksgiving to you and yours. Oh Tom, you always say it so well. Loving this new look on your blog. Also, that pie looks delicious..
Tom, you have a delightful and lovely perspective, and I am relieved to read your postings about all things nature, food, human and real. No smarmy nonsense for me, even if I cannot boast to potatoes growing in the back of my transport. As I am new to your site and have not read completely through the orchard posts, do you grow quince? If not it seems like a worthwhile addition from all I’ve read about your food and enjoyment of beautiful things. They used to be abundant in this region, but now all is suburbs. Too bad, they are perfumy and a fragrant combination of pears, apples, some say pineapple. Makes wonderful membrillo. My last batch of quince came from a local neighbor to one of my students and they are the world different from those that preceded from the store. The goal in life is to enjoy it, projects are ever present and will progress as they progress. Hi Sandy, Thank you so much for taking the time to write such a nice note. My coffee is cold, so it must be your kind words that warmed me up on the this chilly rainy day. Now about quince, funny you should mention. I just picked some from my neighbor’s tree as mine are still young. I’m pretty sure they are Russian variety called Aromantoya. I love their perfume and look forward to making some jam and a tart or two. Of course, that means I’ll have to share their beauty in my next post or two. Thanks for quince tips, and visit, and may I say, I checked out your site. Stunning pastels – vibrant and evocative! Hey, Tom, I was browsing your site a bit further after posting and, of course, saw that you have quince. They are so marvelous, worth seeking and now your link from the quince post to laughingduckgardens.com had a recipe for quince liqueur! What a blast, gotta try so I’m petitioning my student to petition her neighbor for more quince. BTW, I have done a sauce/not sweet jam with previous years quince and then can it like jam so that later I can open a jar and pour into a jelly roll pan to continue it’s journey to membrillo. Or, take it to tart, jam, filling stages. Very festive having that in stock. This year I found hugh quince at the store before my gift quinces and used those sliced in light syrup like spiced pears, oh, la-la! I say that I am channelling a French grandmother at this time of year, since I seem to not be able to stop. Or, considering how full my freezer, pantry, cupboards are … maybe it’s a squirrel! Thanks for the comments on the paintings on the web site, way, way over due for updating so not so recent. I appreciate that you took the time to go look. Oh Tom, there is no editing going on. From what I’ve seen is you’re simply sharing the farm as you see it. It’s like looking through your eyes. And everything is beautiful. Nicholas, dang, I’m humbled by you comment. Thank you. Thanks, Tom, for your honesty and perpetual good humor and wisdom. There are a few blogs that leave me with the feeling of ,”Well, that’s one more person I can never invite over!” I take great solace is clicking over to Tall Clover Farm where life “is.” You remain high on my list of people I would enjoy hosting! Here’s to you! Pam, thank you, yours is a compliment I’m enjoying with my coffee this Sunday morning, and it is deliciously sweet and one big serving of kind comfort. Thank you. I love your blog, your recipes, your perspective and those adorable dogs! :-). Hi Corrina, your kind words are ready fuel for my outlook and gratitude. Thank you and Boz and Gracie want me to make sure that I relay their love and sloppy, but well-meant kisses. Miffy I’m going to have to reveal my flaws more often. Your words, just like your friendship, always touch me deeply. ROFL great post. 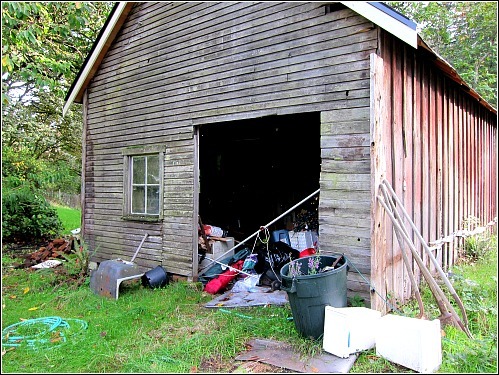 We don’t like to share the stories of evicting a raccoon as big as the 5 year old grandson who has taken up residence in the woodshed. Lovely Dahlia garden though. I tried one dahlia here this year, and it bloomed profusely and then one really good windstorm, and a torrential downpour and the poor thing succumbed and is lying recumbent in the garden shamed that it could not stand up to the Southeastern Michigan weather like the Lantana which it was planted near. Colette, your dahlias need not be embarrassed face down in the dirt. Nope, even here in the Northwest where are rains are gentle (usually) and persistent (always) they can only stand up so long before the insect world yells Timmmmmmm-berrrrrrr! Next year I will stake my the top-heavy beauties. Thanks for the kind words and welcomed visit. Too funny! You make me feel better this morning after being heckled by Mrs. Weekendfarmer on how unorganized I am with ALL the projects. Maybe you two could have tea and she will see, to your point – I am not alone! Let the weeds grow, let the apple be poked by yellow jackets, let your roses be not so plastic-y, but may you enjoy the flavorful drink from the tall glass of life that comes in the shape of a dragon-fly, a sun-set, or just a cozy fire made of twigs on a cold fall evening! Hafiz, what beautiful sentiment and writing. I will re-read it regularly when I need reassurance that my distractions and detours are well-worth the experience and direction. Thank you friend. Karen, now there’s a saying fit for a tattoo, but being from the unmarked generation, I will have to write it down applying my best penmanship and pop the note on my fridge. Thanks! Just catching up with you after being out of town. I was shocked at the new look to your blog, but the content is great as usual. Love the comments for this glimpse into your life. 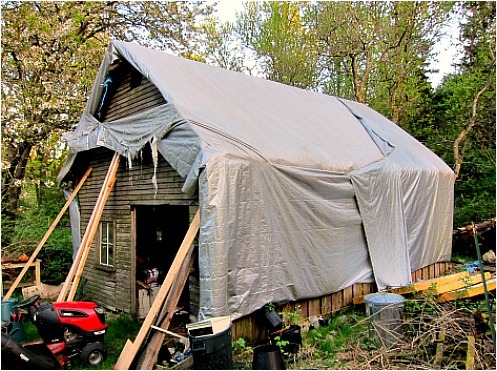 Here at ToadRidge, the projects never seem to get finished, the greenhouse is full and I need more room, and the summer vegetable garden has been forsaken and it is going to seed. But the greens in the fall garden are looking great, it is cooling off, and we just got a much needed rain. We are grateful for everyday that we have in our little paradise and I know that you feel the same way about yours. Hey Miss Toadgirl, hope you had a great trip, but yes, the new blog is a work in progress, so stick with me; the design is in transition. The old template/design was failing me, and having poor download times and freezes. And thanks for the kinds words. Life at ToadRidge sounds pretty special. Indeed, here’s to all the places we call home and paradise.